Chinese students chat as they watch a live broadcasting of the presidential debate between Democratic presidential nominee Hillary Clinton and Republican presidential nominee Donald Trump, at a cafe in Beijing, Sept. 27, 2016. 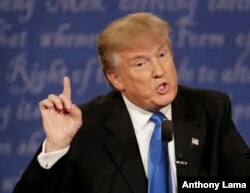 China found itself the focus of unwanted attention during the first presidential debate Monday, with Republican presidential candidate Donald Trump accusing Beijing of stealing American jobs and failing to do enough to tackle the rising nuclear threat in North Korea. During the debate, China was mentioned a dozen times, and most of those mentions came from Trump. In his opening remarks, Trump blamed China for having manipulated its currency to gain trade competitiveness. He also accused China and other countries of stealing American jobs. The accusation about stealing jobs is not new, but following the debate in China, there were many online and on the streets who disagreed, even those who feel he is the better candidate. “China is strong [economically], but that is fleeting, haven’t all the jobs gone to Southeast Asia and India? ” asked Jana, a designer in Beijing who admires Democratic presidential candidate Hillary Clinton’s campaign style and ability to brand herself. Lucy, who works in the financial sector, said she thinks Trump is a better choice than Clinton, but disagreed with his take on jobs. Republican presidential nominee Donald Trump speaks during the presidential debate Democratic presidential nominee Hillary Clinton at Hofstra University in Hempstead, New York, Sept. 26, 2016. Chinese state media kept reporting on the presidential debate to a minimum and there appeared to be a concerted effort to keep it from making headlines. But that did not stop many from discussing and dissecting the candidates’ performances and remarks. On China’s Twitter-like site Weibo, the topic was ranked fourth in searches shortly after the debate ended. But many felt the accusations were aimed more at winning over voters and not necessarily a reflection of candidates true intentions. “It’s a must [for U.S. candidates] to put the blame on China so as to garner support from voters. As a matter of fact, you have no idea how much those in power [in the U.S.] have liked China,” wrote one Weibo user. Chen, a young real estate agent, who could not remember Trump’s name, but said he likes the “aggressive candidate” who has made no secret of his wealth, agreed that the comments were more aimed at boosting popularity. The U.S. real-estate tycoon also praised countries, including China, that have incredible airports, which he said the United States should look up to. But many found his comments about North Korea unrealistic. During the debate, Trump also said he looks to China to solve the rising nuclear threat in North Korea. “China should solve that problem for us. China should go into North Korea. China is totally powerful as it relates to North Korea,” he said. Few here felt China has the capability to do that, given the unpredictable nature of the North’s leader, Kim Jong Un, and the long and complicated history between the neighbors. Chen, the real estate agent who likes Trump, said China would never go into North Korea.